When we all jumped into Merch by Amazon 2 years ago, we had no idea how far the rabbit hole went! As some of you know, we stayed away from the Merch space because it seemed that everyone was starting a t-shirt business and that most of those failed. This ALL changed when Merch by Amazon came out and it became obvious that a winning strategy was creating great designs for a market that was already there and hungry for our products. 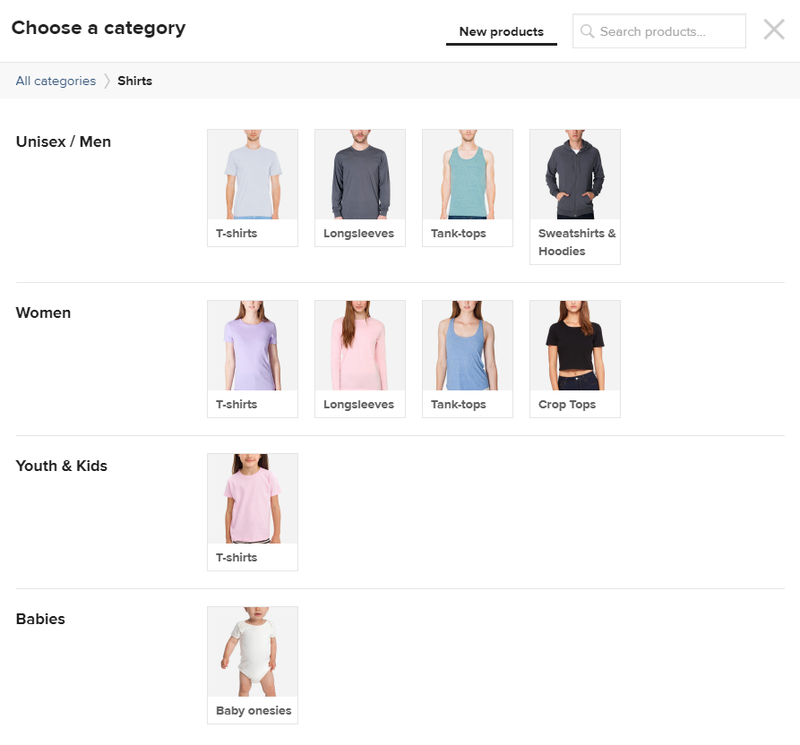 If we did not have to figure out how to market the shirts outside of a platform (like Teespring), and customers would just find products organically and purchase them, this sounded both lucrative and easy! After making hundreds of thousands of dollars through Amazon, we finally decided to take a look at some other markets that follow the same principle. Lots of traffic, and hungry buyers! This guide is going to go over the most untapped market outside of Amazon that hardly any Merchers or FBAers are taking advantage of. This amazing platform is called Etsy and it is just as easy as Merch by Amazon is. 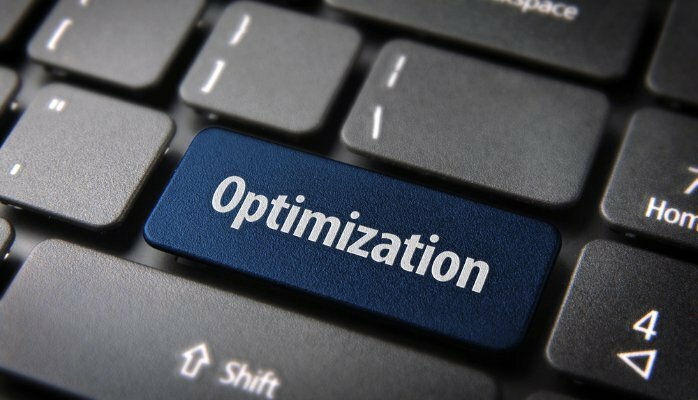 In fact, it might actually be a bit easier in terms of uploading and optimizing your listings. There is already a built in market, and they love spending money. 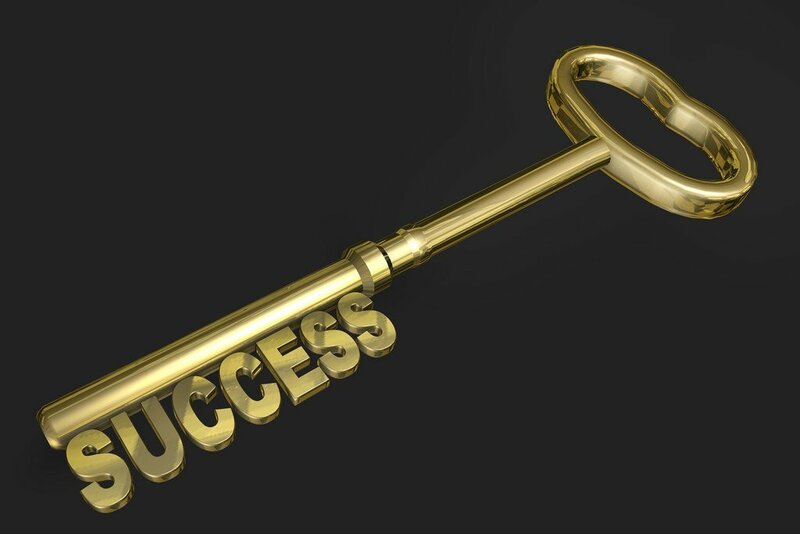 Every internet entrepreneur loves to look for the next big thing and I think this might be it. This is going to be a lot of work to get everything up and running properly, but it is well worth it. You see, the majority of people doing Merch or FBA are focused strictly on Amazon and most of them do not look outside of the organic traffic. Etsy is the perfect platform to tackle because there is already a market, they have their own organic traffic, and you can re-purpose the SAME designs you already have created to sell to a new audience. You can also put them on products that Merch does not have available (hoodies and tanks anyone?). Put in the work with me and lets get into every little detail! I have known about Etsy for years now and have even purchased a few gifts on the platform. From their blurb on Google, they say that they are a peer to peer eCommerce website focused on handmade or vintage items and supplies as well as unique factory-manufactured items. Putting it simply, Etsy is a marketplace for handmade goods and unique items. This generally includes jewelry, home goods, and lots of novelty items such as t-shirts, beach towels, hoodies, leggings, and anything else you can think of. Since Etsy started out as just being hand made items, their audience views all the goods as super high quality and they are willing to pay for that quality with their wallets. Recently, they have accepted production partners allowing you to list your print on demand products as long as you disclose that is how they are being made. The best part though? Items that sell well on Amazon do EXTREMELY well on Etsy! Different audience, same goods, more money! Etsy has been around the block and is eleven years old. They are growing rapidly with a reported 33% revenue growth, and they get a LOT of traffic! While other methods such as the Shopify integration with Amazon allow sellers who are not on the Merch by Amazon program a chance to sell on Amazon, these products are not prime eligible and thus suffer a bit in the results (although it is still lucrative). With Etsy, you are not competing with Amazon sellers. Because they are considered a smaller market outside of Amazon, Amazon sellers are not even considering selling on this platform, which means a massive opportunity for you! There is ZERO barrier to entry to this growing market. You do not need to hold any inventory, you do not have to deal with Chinese manufacturers at all hours of the night, and you have access to their entire user base of customers. If you are someone who wants to get into something that other sellers are simply ignoring or do not know about, Etsy is your ticket! Before we get into the method, I want to give you some insight of how I came to know about this opportunity that we were missing. (Screenshot above from one of Joel’s Etsy stores). While I was in Seattle for a Merch by Amazon conference, I decided to share a room with a guy I had met only a month or two prior online. I knew he was doing well on Merch but did not often talk about his numbers. I figured this was the perfect opportunity to network with someone that was killing it in the space. It was not too long ago that I thought conferences were an utter waste of time, but after my very first conference that I was invited to, I met a guy that explained a method outside of Merch that I tried out and ended up putting an extra thousand or so dollars in my pocket every month. From that point forward, I knew the value in a conference was not the content at the conferences, but the people you meet and talk to. So here I was, sharing this room with this guy (Joel Barnett if I have not mentioned that yet), and we had to wake up the next morning really early to Uber over to the conference room at the hotel. I woke up pretty early (different time zone), and I see him laying on the bed on his phone, already awake. I was pretty shocked someone would be up so early so I asked him what he was doing. “Fulfilling Etsy orders” I was told. Curious as to why he would care enough to get up at 5am to fulfill Etsy orders, I had to ask about the market. I asked him why he would bother with that market at all when Amazon had so many hungry customers and it seemed like more work than it was worth to list on other marketplaces. We got to talking about the entire process and his numbers blew me away! Here I was focusing all my efforts on Amazon and meanwhile Joel was making thousands of dollars using the exact same designs he was using on Merch. Joel told me about different print on demand services he was using (he used someone different than Printful, which is why he had to fulfill the orders himself), and the pros and cons of each. When I got home, I put a plan in motion right away to scale up this side of my business and this is why I wrote this guide. Even though the screenshot above looks to be a nice chunk of change, neither him, or anyone else I know in Etsy has been through a proper Q4 yet so this year should get interesting. 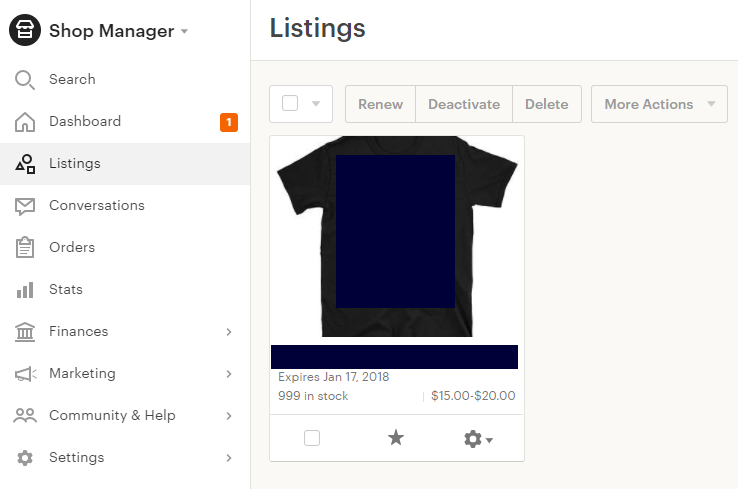 Use Printful To Sell Your Merch On Etsy! A lot of you reading this are going to have at least heard of Printful. 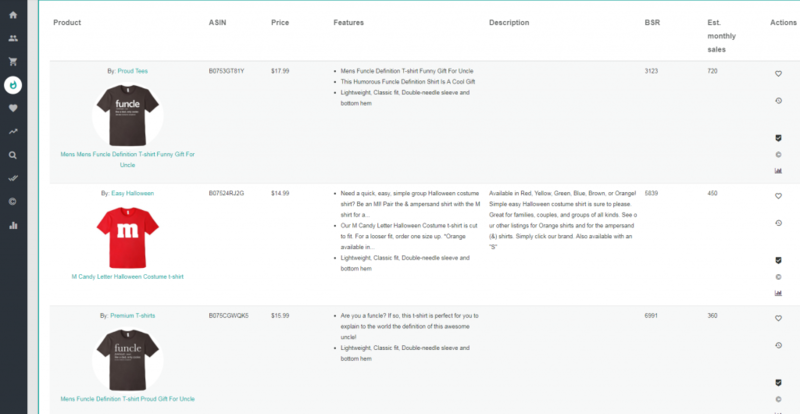 Generally, I found them much too expensive for the Shopify integration, but they are just perfect for Etsy. There are a lot of different print on demand platforms that you can use for Etsy. Some of them are automated while a lot of others one are not. 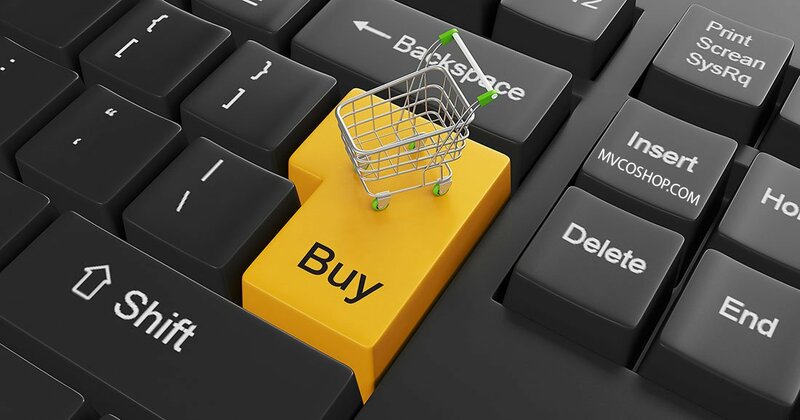 This means that you would need to move orders back and forth when you make a sale. Since we like to make things nice and easy, we decided to go with Printful as the entire process is automated! Lets get started with setting everything up. Click here to sign up for Etsy. The link above will give you access to 40 free listings to Etsy so you can get everything set up and running for free right off the bat with some of your shirts. You must select what best describes you as a seller on this page as well as where you are from and what kind of currency you are dealing with. Once those are filled out, click on Save and continue. The next page is where you are going to select a brand name. Keep in mind that Etsy is a little different than Merch. All of your shirts are going to show up under the same shop here. This is similar to your brand, so make sure you pick something broad that you can put all your designs under. Etsy is a great channel to brand yourself and especially to make more sales. This can even be used before you get accepted to Merch by Amazon but also works great as a supplement to what you are already doing. The next page in the process is going to ask you to add listings to your shop. This threw me for a loop the first time I was setting everything up. You MUST do this step in order to get your shop “online”. 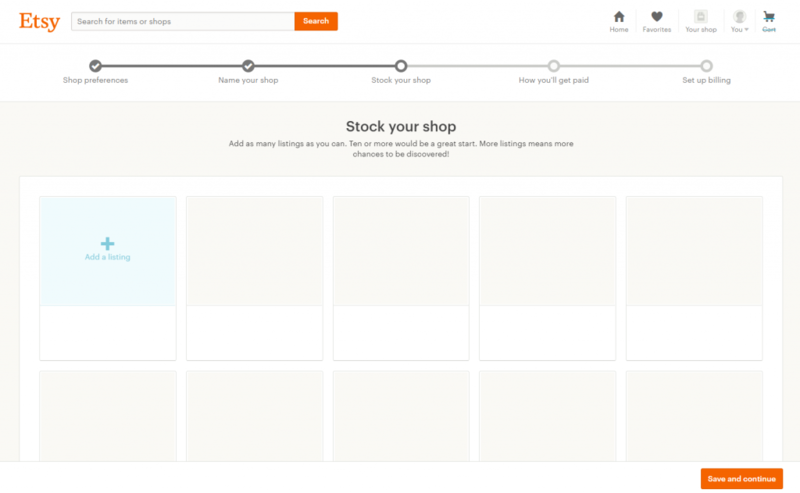 Once your shop is online, you can delete the product you are about to add and continue with the integration. 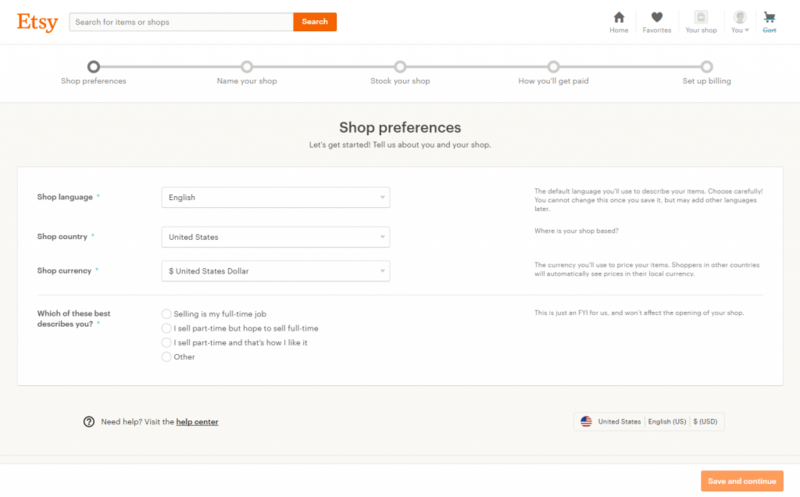 Select “add a thing” and go through all the steps in order to get a product online. Remember you will not actually be selling this product, but this will introduce you to the steps. Click the button to fill out your banking information. Finally, set up your billing with Etsy. This is how you will pay your bill for the listing fee (which you should not have to use for the first 40 if you clicked on the link above). Now that you have a dummy product in your Etsy store, your store is officially online. Your billing has been set up and you have entered in a bank account where you can now get paid! Since we do not want to go through each and every listing manually, we need to hook up Printful so that we can easily push products to Etsy and get them fulfilled without actually doing anything. Click here to sign up for Printful. After you have signed up, click the link below to connect to Etsy. Click here to go to Printful. The link above will look exactly like the screenshot. Click on the Connect Etsy Shop. It will ask you to quickly make an account for Printful, and then walk you through the process. You will need to click on the big red button and then allow access. You will then see this step which means you are ready to start adding products! You have successfully integrated Printful with Etsy. Everything is set up and you can now start adding products from your POD (Printful), and sell them on the Etsy platform! This is probably one of the most simple uploading processes I have seen. 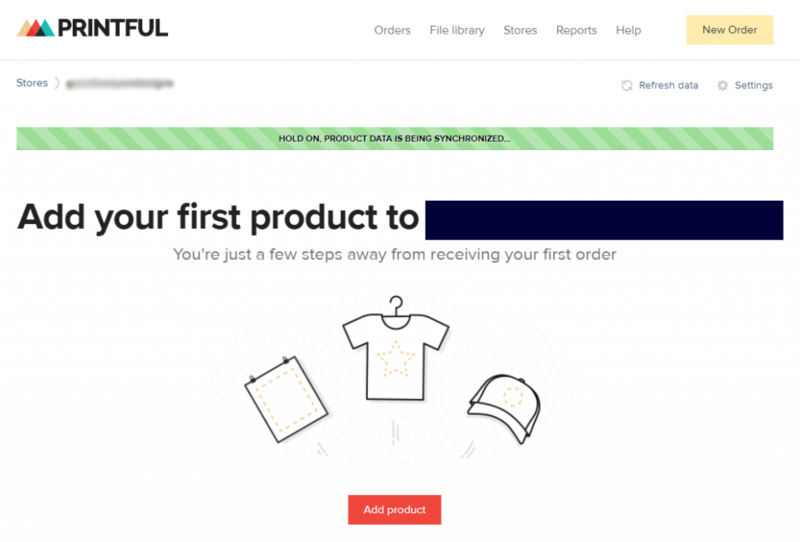 First, click on the red button that says “add product” inside of Printful. We will be doing t-shirts right now, so select t-shirts. This is going to open up the different types you can pick from. As you can see, there are a ton of different options here! For now though, we are going to go with Unisex t-shirts so we can sell to both audiences fairly easily. This will bring up the different t-shirts you can pick from with their base price and colors available. As you can see, some of them are more expensive than others. 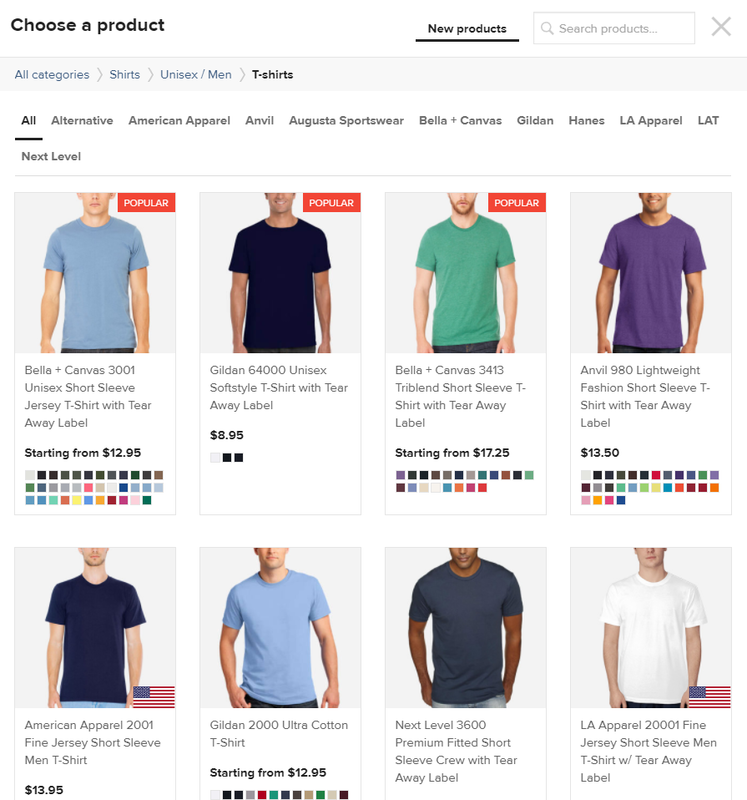 I noticed right away that the Gildan 64000 is extremely cheap, but they only offer 3 colors. I will be going with that one for this example, but in the future, you might want to go with the Balla + Canvas 3001 if you want the biggest color selection available to you. 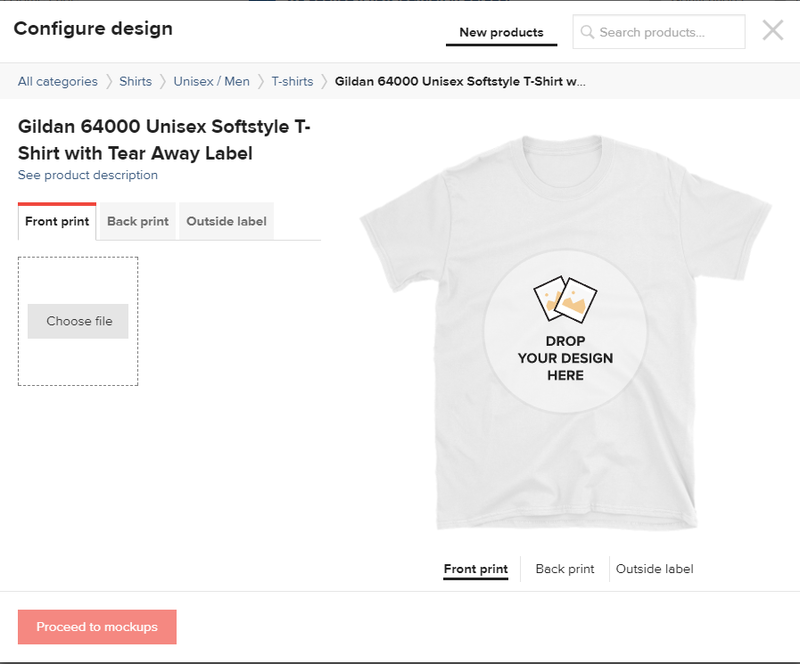 Pick where you want to upload your design and then add a label if you wish. I decided to not add a label and do exactly what I am doing on Merch by Amazon which means just front designs. 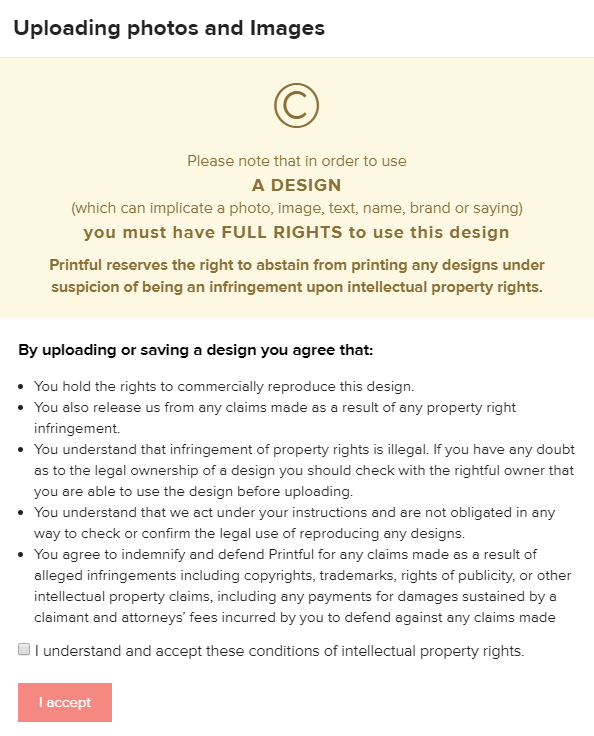 You still need to have the rights to the designs you are putting online. This is very important. Just like with Merch, make sure you are checking trademarks and that all parts of your design can be sold. Agree to this page, and click on the red “I accept” button. The next page is going to let you see the mockup. Pick the colors you want and the sizes you want to be available on Etsy. 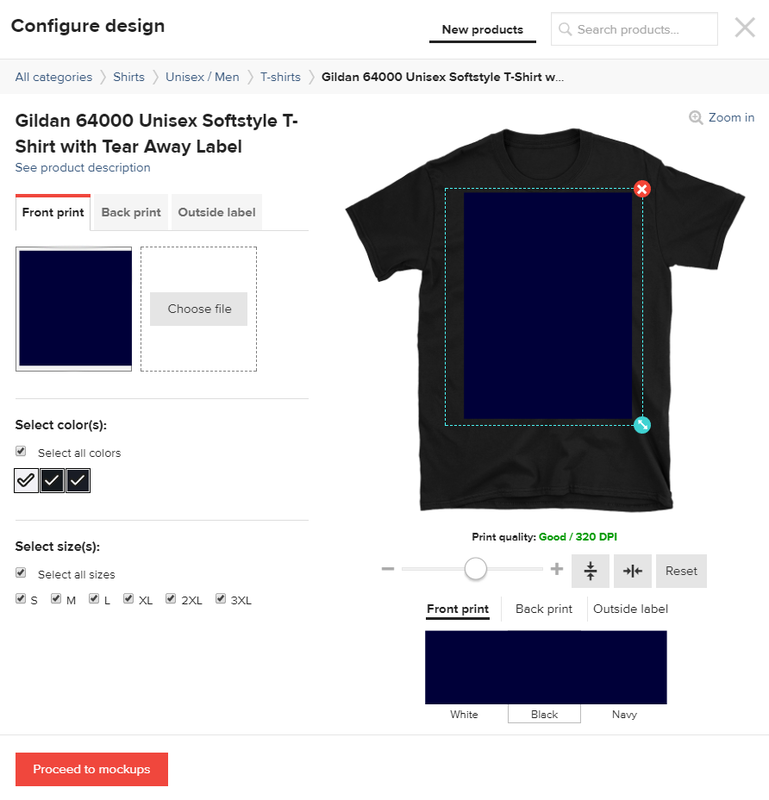 It will allow you to see the mockups in all colors, but what I REALLY like about this page is that it allows you change how big the design is on the shirt. I have a few designs that are a bit small, but as we all know, bigger and bolder designs sell better. Use the small slider to make the image bigger. It will also tell you what the DPI of the image is going to be. Once you are happy with how everything looks, click on the red button at the bottom. This page is going to allow you tio pick if you want a flat front and show you what the mockups are going to look like. Pick the one you want to display as the main image. The description is already going to be half filled out already. Put a few line spaces up top and then enter in some bullet points. I like to keep these similar to Merch by Amazon as well. This is where you should SELL the customer while being descriptive and adding a few keywords. 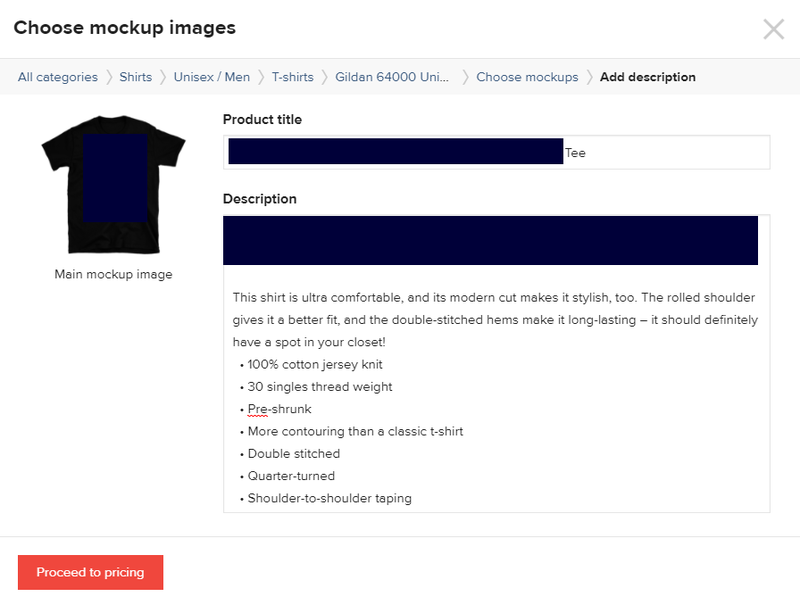 It is also a great idea to look up the t-shirt style you selected and include a size chart in the description as well. 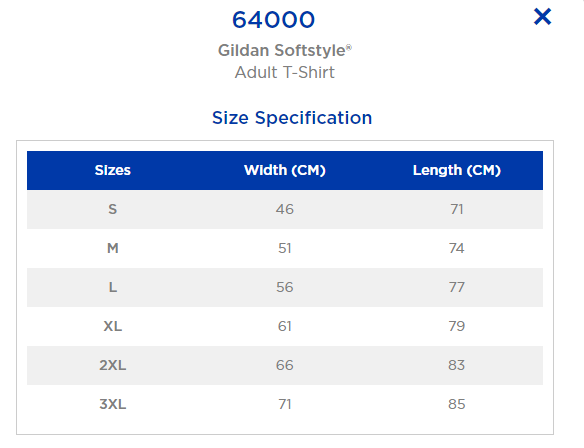 For this example, I used the Gildan 6400 so I simply Googled “Gildan 64000 size chart” and then included that in the description. Click on the red button to move on. This is probably my favorite screen in the entire process! You can play with the profit percentage and what you will sell for at retail price. As you can tell, even pricing it at normal prices, you will make a very healthy margin! I kept mine at 65% but these prices seem to do very well in the space. When you are happy with the numbers, click on Submit to store and get the ball rolling! 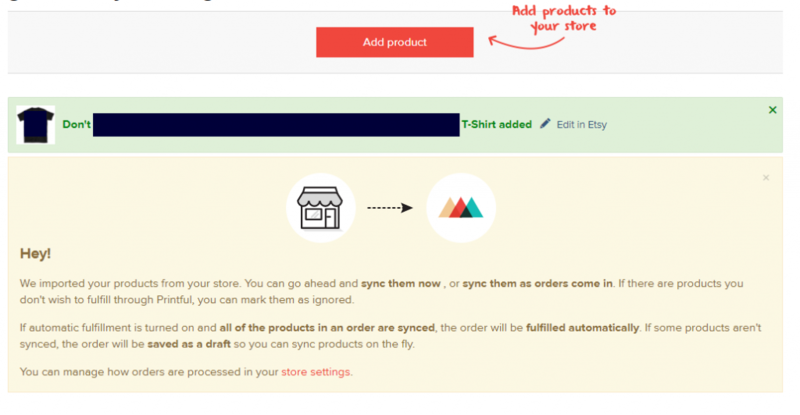 After a few seconds, it will sync to the store and you have your first product live! Below, you should be able to see the variations that have been added. It will look like this. These are all the sizes and variations that have synced with your Etsy store. Your first product is live and for sale on Etsy! Congrats! You are not done though! There are a few things you MUST do before you can consider this listing complete. Head over to Etsy and click on Listings in your Dashboard to the left. You will now see your active product in your dashboard. Click on the little wheel cog and click on Edit. You will see all the photos and listing details for this product. Scroll down until you see “production partners”. You MUST NOT FORGET THIS STEP! If you do not add a new production partner, Etsy will more than likely ban you in the future. Click on the Add a new production partner and fill out the information for your Print on Demand service. In this instance, we are using Printful, so I filled out all the information. You can easily find out where your POD is located by a quick Google search and enter in everything that is asked. After you have added the partner, for each listing in the future, you simply need to return to this step and click the checkbox next to the product partner. The final step here is to scroll down right below production partners and find where it says tags. They say this optional but it is NOT if you actually want to make some sales. Think of tags just like you would Instagram. Instead of using the keywords in your listing like you would on Amazon, this is where you add your keywords. Add them to the tags, one at a time. You can use up to 13 tags and these are what are searchable in Etsy. I would highly suggest filling out all 13. After you have added the tags, click on publish near the bottom of the page and that is it! Your listing is now properly optimized and live for sale! Go out and add as many products as you have and scale! Now, before we get into the research and marketing, there is something you need to make sure you do as a last and final step. When you are filling out your profile for Etsy, you MUST fill out your about section and mention that all the designs are your ideas but that you are using a production partner to help you print. Put this in the about section. You can get to this by going to your sales channel in the backend of etsy, and scrolling down where you can then add an about section. So many people think they can just put up products and retire the next week. This is not how any of this works. Research is probably the most important part of the procoess and marketing is something that you may want to consider to kick start the entire process. Consider Etsy a market place similar to Amazon but with a very targeted group of customers. From my experience, Etsy buyers are willing to purchase from Etsy at a HIGHER price than customers on Amazon or any other marketplace. Etsy started as a hand made market place so this is probably why they are willing to pay a higher price. They see the goods as much higher quality even though they are the same type of print on demand products we have all come to know and love. If you are already doing Merch by Amazon, you know how to do your research because you already know what is selling. I would upload those products first. Otherwise, this is exactly how I do my research for Etsy. First, I open up the Merch Hunter. This is going to show you the best selling products on Amazon and what designs are absolutely crushing it. Take a look at what is selling on any particular day and take note of what keywords they are using in their listings. Once you have found out what is selling well on Amazon (because these items will do well on Etsy), head over to the keyword tool within Merch Informer. Since it seems that uncle shirts are popular, put in the keyword “uncle” and search. Amazon is suggesting all these keywords because they are a big data company and know that these keywords are getting sales. If Amazon knows these are good keywords that people are SEARCHING for, they make absolutely perfect tags on Etsy. Write them down or add them to your favorites so you can export a save list later. 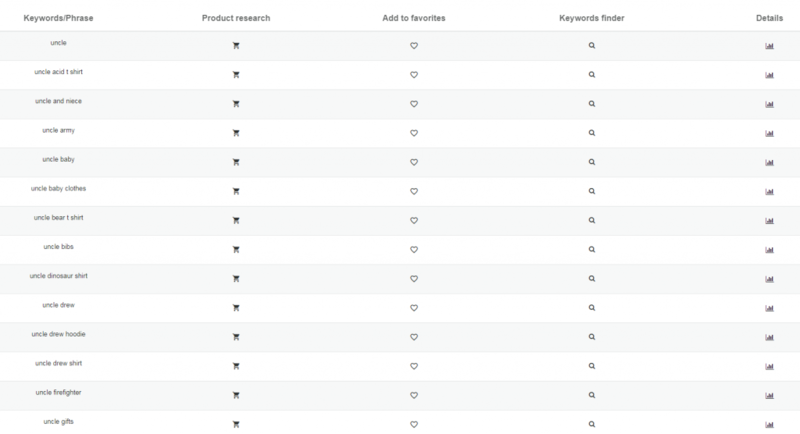 You now have a list of targeted keywords and synonyms that you can use to make GREAT tags on Etsy. This method works, and it works really well! If you have been following my girlfriend’s merch case study, we set this up for her the other day and she made her first sale just over 24 hours later following the steps above on Etsy. 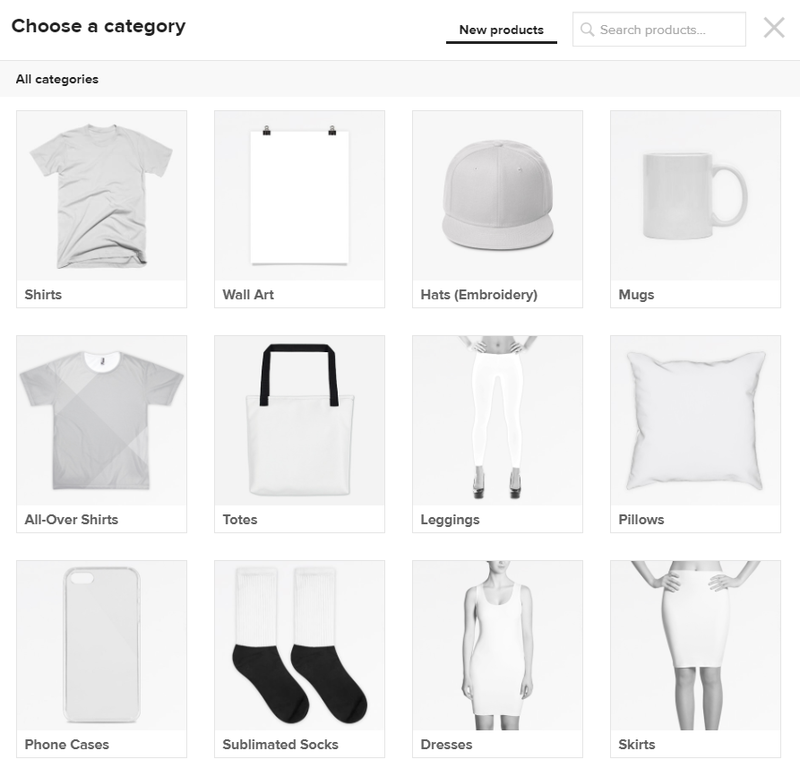 The Printful/Etsy integration represents a huge opportunity for anyone not in the Merch by Amazon program and an even BIGGER opportunity for those who are already active with print on demand. You can take the designs you already have and re-purpose them for a market that caters to the types of goods you are selling. What sells on Amazon sells great on Etsy and on Etsy you can sell some things you would not be able to on Amazon (cursing/marijuana designs). If you have not yet jumped on this opportunity, you are just leaving money on the table. There are buyers on Etsy who are never going to visit Amazon or any other marketplace. Just like you might have a favorite grocery store, buyers have their favorite marketplace. There is zero need to run any traffic with this method, zero inventory to hold, and thousands and thousands of dollars to be made! Let us know in the comments how your business has changed by implementing Etsy as a sales channel! I opened my Etsy and Printful accounts a few days ago, but haven’t integrated the two yet because I wanted to understand how Printful’s shipping charges would impact profit. I love that they fulfill with my branding, but without additional research I hadn’t come to a point of knowing I could charge enough to cover the cost of goods shipped by Printful. Do you have any insight you can share? It’s very possib le I’ve misunderstood their shipping fees! 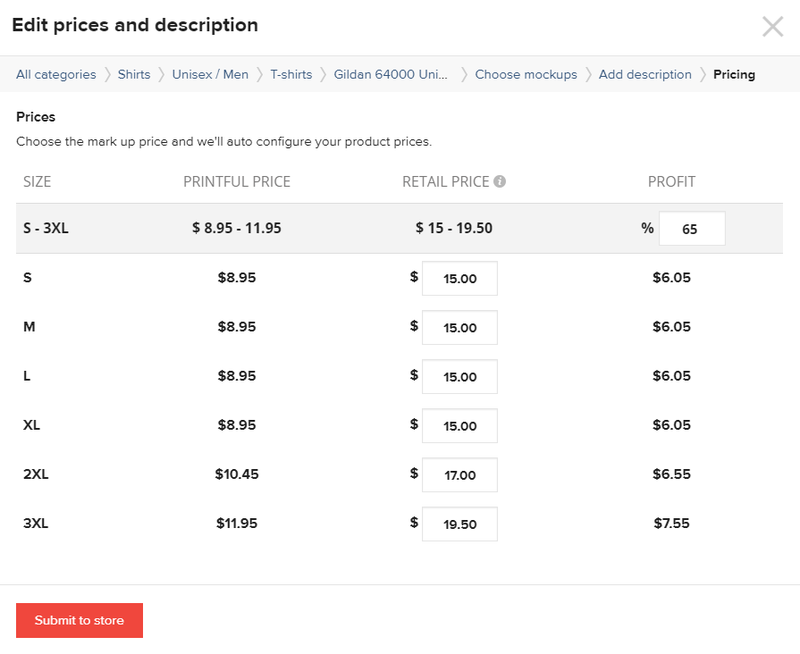 They add $5 shipping to the listing automatically so when you see in Printful what the profit will be, that is the profit you will get after your card is charged for the purchase after an order comes in. Terrific. Thanks for clearing that up, Neil. Hi Neil! Can you explain more about ” after your card is charged for the purchase after an order comes in”? What should my card be charged for? Thank you. In the screenshot in the article where it shows your profits, you are paying the printful price to printful for having the shirt created and then the customer pays you the retail price. Everything is automated with Printful so the orders will get taken care of by them and then shipped out. You will need to do your own customer service though so if a customer is not happy, you will need to handle any refunds. Great opportunity without a doubt, but one thing to note with etsy vs merchbyamazon is that you also need to collect an submit sales tax on you’re sales when selling on etsy. So my question is how did you go about setting that up and if perhaps you could write a guide on that? As that topic being one of the most confusing and cumbersome of topics for a lot of people trying to get into these types of businesses an do so legally. Thank you for reading my comment. There are lots of different services that will help you with the tax thing but I do not have any to recommend currently. This is something you should talk to an accountant for though to make sure everything is by the books. Taxjar is one you can use in the states. Empire Flippers just did an hour long podcast with the founder about the challenges of scaling fast. Printful looks to have setups in California and North Carolina so since your inventory would be located at those locations at time of purchase you would have what is called nexus in those two states and in your state since that’s where your business is registered. You should only have to pay sales to on orders from customers who have goods shipped to those states. I am not sure if etsy has a way for us to set up sales tax collection or not so that may cut into your profits a tiny bit, but like I said only from customers in those three states. This is my personal insight given research and a little experience with sales tax but I am not a professional in the topic. You may not have to charge sales tax – it depends on your state’s rules. Google small business tax law with your state name. I’m in Texas and since I don’t have what they call a ‘nexus’ of operation here (no storefront, warehouse, etc) then I’m not required to charge sales tax. Some states require it for ecommerce and others do not. Thanks for the great article! By the way, is there a way to contact you directly via email? I tried using the contact us on this site but can’t seem to get a response. Thanks for the tutorial Neil. I have noticed that Printful use a different file size to Merch by Amz. Do you think its okay to use the png file use for Merch by Amz, for tshirts and long sleeves? That is what we have been doing and then you can use the slider to resize the image on the actual shirt. Amazing post with plenty of detail! Was the sales received above due to organic traffic? Or was traffic being driven to each store? Interested to know about your girlfriends store especially. Are you happy with the mockups provided by Printful. I read where others are creating their own because they said the ones provided by Printful are not eye catching enough for Etsy. They seem to be okay, but there are some pretty amazing mockups out there that I think you could do a lot better with if you were to take the time to upload them for your designs. could you please explain us how do you upload your own mock up ? do you do it when you are on printful or you do it on Etsy, please step by step. also i want to buy an amazing mockups where do you recommend ? I am using the printful mockup currently so not adding my own. Thanks for the tutorial? Around how many items do you have up to achieve your revenue? I’ve been doing etsy for about 3 months now (15 shirts) testing it out without the integration. I’ve sold about 20 shirts but your revenue looks great! The screenshot is from Joel’s account and I know he has a few hundred products up. Came here to let you know that you missed masking one of your images… refreshed and it looks like you fixed it already – nice ninja edit! Great stuff Neil – I’ve set it up let’s see if we get some hooks in the water for Q4! Took all the images through a dummy store, but I still missed it! BTW – what would be a good pricing strategy for the Bella shirts? I feel like 60+% margin seems too high for a tee but I really don’t know the profile (and price sensitivity) of a typical Etsy consumer. Is $24 doable? I think that is very doable on Etsy. They love to pay higher price because of the handmade market. This is more complicated than it appears. In Etsy, the customer pays the shop owner who then pays Printful. So shop owner must worry about sales taxes and accept credit cards and also set all the return/exchange policies which the shop owner is responsible for. Not at all simple and transparent. Is there no Etsy UK store? Obviously the sales would be a lot less but then we’ve only got to worry about UK tax laws. Your timing is amazing! You are always so helpful and your step by step process is detailed with easy to follow step by step. Would you still recommend Shopify and Teelaunch? I also often read on forums about Merch designers on several PODs like RedBubble. Are you currently on these additional platforms, or just Merch By Amazon and Etsy + Printful? It’s probably just me, but Merch definitely takes up much of my time on its own! I have a VA uploading my designs on Teelaunch for the Shopify integration. MBA definitely makes up the majority of the POD income though. We shall see what Etsy holds in the future! Hi Neil, thank you very much for the guide, I was actually already interested into doing Printful on Etsy and here your guide poped up. I have a question about payments. 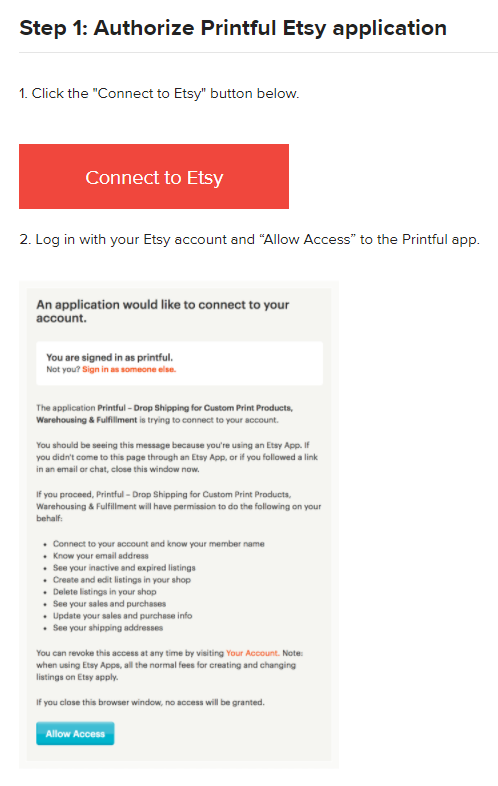 How does it work – customer makes an order, money goes into my paypal (I do not have Etsy payments because of my country) and I have to manually pay to Printful before they start to fullfill the order? Or part of the money, that customer payed, will authomatically fall into Printful account? How does it work? You will need to set up a payment method on Printful. This can either be a card or paypal, but you must pay this from your account before the money will show up in Etsy (you can get your etsy money in about 3 days). Great blog post as always Neil! Thanks so much man. Quick question, what other products are you selling/having success with? Thanks again! I’m a little confused about what to say when Esty asked for my POD’s location. I’m using Printful, and I see they they are in California and North Carolina but I have no idea which on I’m supposed to put down. I put their address in California. I would ask people to not put in tons of time for this just yet. I saw this post today and have been pushing many of my products to Etsy today. It took 4-5 hours of messing around with it until Etsy disabled my account. I am a tier 500 seller on MBA and I am well aware of how to play by the rules. I am confused why it got deactivated. I have contacted Etsy to hear what is up and will update once I hear something. It is likely that these Printful products potentially aren’t living up to Etsy policy? Did you mention the product partner on each listing as well as check the box in the product listing on Etsy? You should also disclose that on the about section. Please do update when you have more information as I have had no issues yet. I did indeed. Tried to be as transparent as possible. I got a reply back from Etsy and they have reopened my account. They did not tell me exactly why my account got disabled, but they corrected it and they were sorry. So I presume everything is alright after all. Awesome! Thanks for reporting back. I’m a bit confused about what we do after someone buys a shirt- do we have to deal with customer service and shipping etc? Or does Printful handle everything just like Merch? Printful will handle the order and shipping but you will need to do the customer service. I have got a question. I´m from germany and followed your instructions. Now the first shirt is live on etsy, but I don´t know if this product can also be seen in the USA, or only in the german market place?! Can someone help me out with an info? 😉 Thanks guys. If you signed up on Etsy.com you will be selling to the US market. Hi there! I’m also from Germany … how do you handle the tax in Etsy/Printful? Is there any other companies we can use to fufill the orders, like custom cat? I have a subscription with them and they are cheaper per product. Or is printful the best? There are a lot of different PODs you can do this with but I went with printful since they automate and integrate with Etsy. I simply copy and paste the sizing chart into the description on Etsy with the measurements for that shirt. Sorry sent that before I finished. *How did you put in the sizing chart into the description? Did you have to convert it do text? Google the shirt and find the sizing chart. Then simply type it up and put it into the description on Etsy. Hey Neil, for some reason my designs are failing to sync to my etsy store. 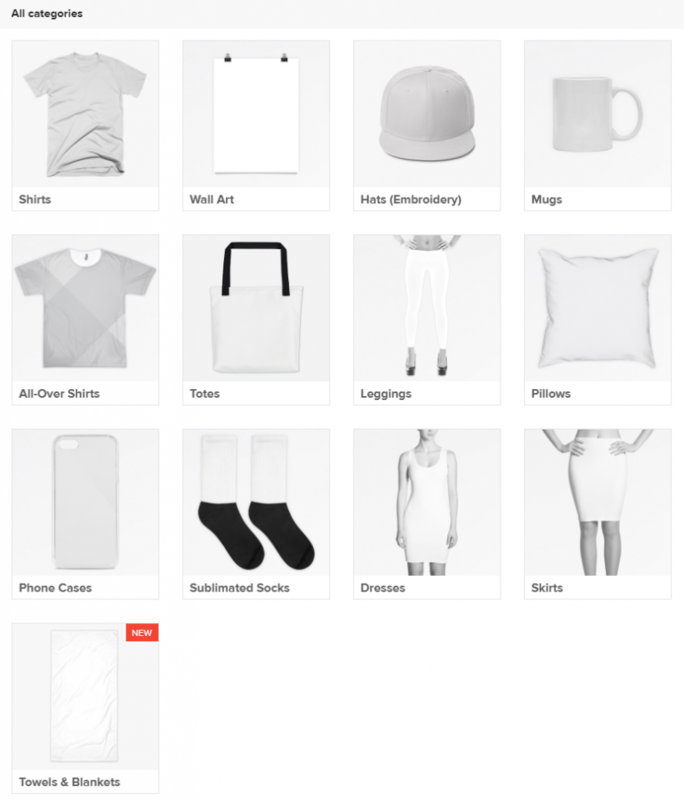 The store is connected on printful but for some reason, after upload all my products and thir variations are labeled “not synced”. Any insight as to why this might be happening? I think Printful might be having a bit of an issue. I would get in touch with their customer support and ask to make sure. Same issue here, I upload through printful then the products go out of sync. I contacted printful support and they said they will contact their developers and get back to me. Hei Neil, great write up about the integration. Thanks! Neil, quick question, what about the Non-US seller who want to sell on etsy.com (US) who want to use Etsy Payment service? I’m from Indonesia. I read about the need to fill residence addres. I plan to use Payoneer (debit card) and it gave me the US bank account as my deposit. Where you able to setup your your shop as an Indonesian? Not yet. I decided to do more research. Since etsy is very strict on every little detail thing but it’s worthed for the longterm as my goal. I just cant ignore their 192 million monthly visit and tens of millions buyers. Anyway, What’s your progress with etsy? What would you suggest adding as your shop’s policy on Etsy to keep costs down on exchanges and returns? Just make sure you are putting in the sizing charts to each of your listings so that they know exactly what kind of sizing to expect when they order. I would get a payoneer account. As usual – love your article. I do have a question though. I have heard all the positives for opening an Etsy shop with the printful integration, however, I would like to hear about some of the negatives. What do you see as potential turn offs with regards to this platform? And when you mention that refunds need to be taken care of on our own – do you also mean that you are out the money if a shirt is refunded? Can we, in turn, get a refund from printful? Do you know any details on how this would work? The biggest negative is that you have to deal with the customer service =( That being said, if you do get a return, yes it would come out of your pocket, but only if the return is for sizing or something like that. If the print is off, Printful will ship another one. I noticed the shirt you are using only has three color options. DO you find that being a problem? It depends on the type of shirt you decide to go with. I like to go with colors that look best on the design, so I might switch up which shirts I pick (so I can pick more colors). It has not been an issue on the ones I have selected thus far as they are getting views and a sale or two. Neil, i just read one of Etsy’s rules about the creative/design process which involve the pen sketching and etsy wanted the photo/screen shot of the prosess. Do you do that? Now, i know you’re not a the designer, how do you dealt with it? Have not had to deal with this at all. Neil the link for the 40 Free Uploads no longer works. I posted this on Facebook and someone else confirmed that they were also told by Etsy the same thing. I contated their customer services at Etsy and they just said Too Bad! What issue are you getting? When I click the link myself, it is still showing that people will get the 40 free listings? Do you have a screenshot I could take a look at? Thanks for this great article Neil. I am an artist/designer my brand is callled Viva Sweet Love. I hand screen print my original designs onto T-shirt’s, messenger bags, dish towels etc. I’ve been doing this steadily since 2011 and have a decent following. I really want to get out of printing and holding inventory for I can focus more on creating new designs. I also want to be able to offer my designs on other products like mugs etc so live he idea of a print on demand partnership. Here’s my First question- should I open up a second Etsy shop just for the Printful products? I still have lots of printed stock I need to sell before I switch over completely to POD fulfillment. 2. 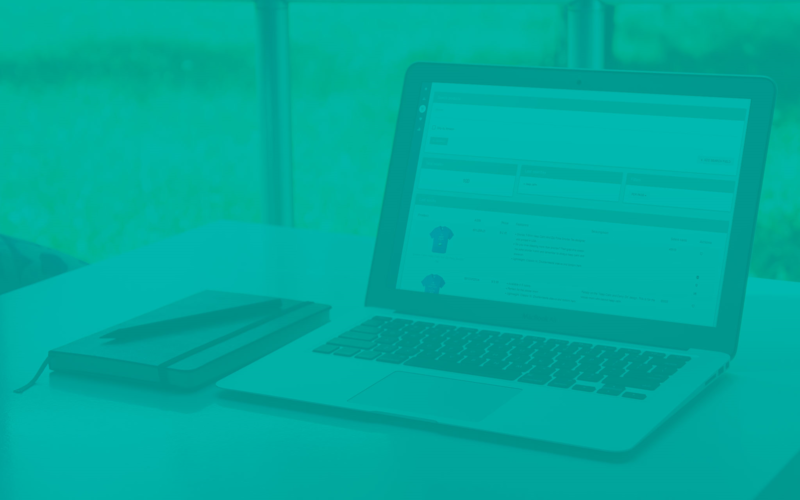 Returns& exchanges – especially on T-shirt’s- what is your policy? This seems like it could be a potential problem- especially exchanges since you’d have to buy a second shirt from Printful. Any advice you can give us greatly appreciated! I would not open a second shop becuase you have put so much effort into the one you have now! The only products that will be fulfilled with Printful are the products that you push from Printful to Etsy. As for Returns, yes, you would have to eat that cost but this is only if if it is a sizing issue or something else. If the actual print is not good, Printful will ship another product to the customer. Hi! I just wanted to mention another rule Etsy has–if you have more than one Etsy account and/or shop, you have to disclose each account somewhere. I put mine on my profile page. If you don’t and they find you, they will shut down all your shops. I’ve known several people this has happened to. Do you typically match your tags with your titles? So far that is what we have been doing. What integration do you prefer teelaunch w/etsy or printful w/etsy? 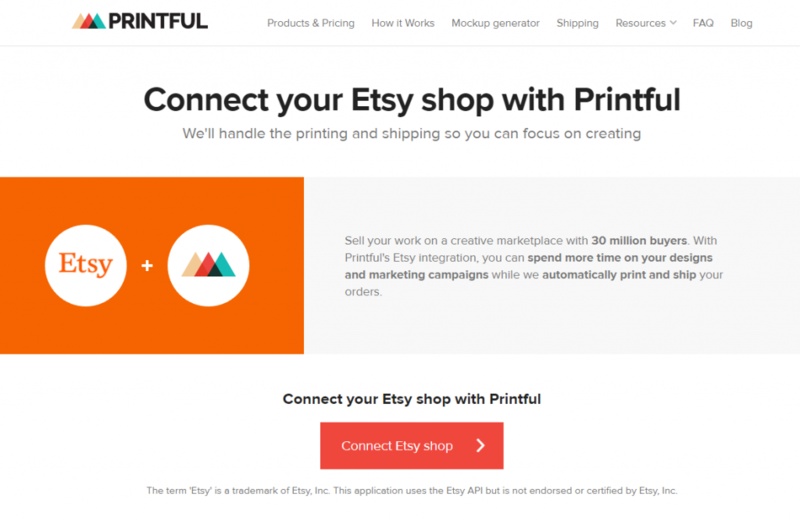 Printful with Etsy is what are currently using at is is more user friendly. Hello Neil! I’ve been always your fan! Great article as always. I uploaded all my designs from MBA to Etsy. I followed your guide and guess what? I got my first sale after 24 hours too! I have been hearing good things about Printful. I want to sell mugs on Etsy. Would the Printful Platform allow me to personalize the design by adding the customer’s text such as a name. You should be able to do that, but you would need to upload a new design to printful with their name on it for the customer. Hi there. Thank you for this article and the time you took to write it. The problem I am having with Printful is their initial prices are so high that they leave me with a measly little profit while they make all the money. The shirt you have in this article is the only one at that price. The rest are more expensive. Some even go up to 20 dollars. How am I going to make money doing this without selling a ton of product? Isn’t there a better company than Printful? You didn’t mention the name of the company your friend was using; would you care to share that information also? What are your thoughts on this and maybe an explanation of how I am not seeing things in the right light or suggestions would be helpful. Thank you for your response in advance. You could use Teelaunch, but I find Printful a lot easier to deal with with this integration. We are just currently doing T-shirts and using the first two here: https://gyazo.com/7490a7b1194fdcfe871386eed631319e. As you can see the prices are decent so if you price at 20-25 dollars, you are making a very healthy profit. I am from a country that is not in Etsy’s country list. I have payoneer account. How can we be involved? Great post! It’s actually the second time I’m reading it. I have an Etsy shop since Sep 2017, when I was a complete newbie to Merch (I’m still only in tier 100). To be honest I didn’t have much success on Etsy (only 30+ sales, so far), I’m not sure if it’s because I mostly uploaded mugs. So my question is: should I sell more T-shirt designs instead of mugs? 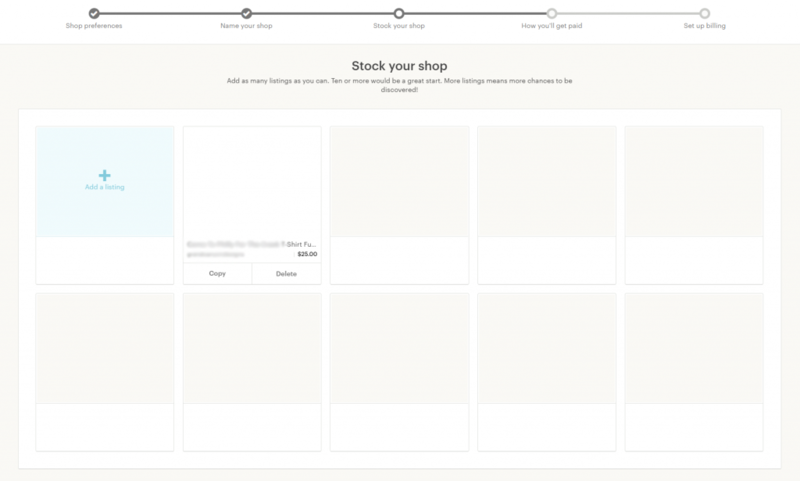 and should I make my shop niche related instead of general shop with multiple niches? I think a shop with multiple niches is just fine but you will need to play around with it. Personally I am doing mostly t-shirts with some tank tops thrown in. Thanks for this great post Neil! Do you know if Etsy is also more lenient towards parody type shirts or are they just as strict as Amazon in banning anything remotely gray area? I am not sure on that front as I have just avoided those all together once Amazon made us remove them. Great article that has just answered major questions as an Etsy newbie. This integration solves it all for me. Thanks Neil. So if im selling a cat shirt on etsy, should i put the keywords related to “uncle” so in that way i rank up? No, this is a very bad idea. Ok my bad i misread the article. best tutorial ever Neil, thank you! you helped me a lot! !